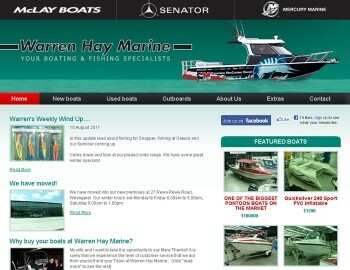 Service – that is what the team at Warren Hay Marine strive for. We will make your dealings with us, from buying your new boats, used boats, outboards and boat and motor servicing through to buying a few sinkers for your next fishing trip, a pleasure and going that extra mile, along with sound advice that have been gained over a life time of boating and fishing. All of the Warren Hay Marine team have a passionate interest in the products they sell and service. All are mad keen fishermen and boaties, so stick around for the best advice of where to go, how to catch fish and how to get the best out of your boat. Please don’t hesitate to pop in or contact us should Warren Hay Marine be able to assist you with your boating or fishing needs.